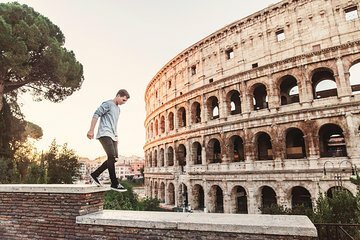 Reserver dine billetter til Roms mægtigste ruin, og spar tid med at komme til Colosseum. Udforsk gladiatorboder og løvepenne i den gamle arena i dit eget tempo, og tag derefter de høje synspunkter, som engang har haft glæde af kejsere på Palatine Hill. Inkluderet adgang til Forum Romanum afsluttes denne selvstyrede tur til Roms mest populære trio af gamle steder. Gain de temps pour le billet coupe file. Rdv précis 8 minutes de file ! Super !! Visite du mont Palatin à notre aise puis Colisée. Skip the line without feeling like a tourist, a very discreet personalised entrance without the tour guide. But be aware you don’t get access to the centre of the Colosseum, tour groups only. The attractions were incredible and the skip the line pass saved us from am all day line. Dont attempt to see colosseum without a skip the line pass. Tour guide barely spoke English - spoke French to the group. Thankfully a nice gentleman translated for me or I would have been very confused. This tour was scheduled for 11:00 - she told us our Colosseum admission time was 1:00 and to make our way there ourselves at that time. Skip The Line is a fallacy - the line was enormous and we got no help. At 11 she walked us to the entrance of the Roman Forum, and said we were on our own and could go to the Colosseum line at 1:00. If I would have wanted to actually get in at 1, I would have had to stand in line the entire time from 11-1. I gave up, bought a Roma Pass, and walked right in with that. Complete waste of money, as it was not as described, and no line was skipped. We absolutely loved the the Colosseum, and we did skip the lines with our tickets.